Gold prices nudged back above $1,400 an ounce for the first time in two weeks Thursday. That may not seem that dramatic, but for an asset that investors had been shunning lately, it may signal more gains lie ahead. Gold miners were faring well. Shares of Randgold (GOLD) rose more than 4%, Kinross Gold (KGC) rallied 8% and AngloGold Ashanti (AU) gained nearly 7%. Everyone was jumping on the gold bandwagon Thursday. The Market Vectors Gold ETF (GDX) popped more than 5%, and Direxion Gold Miners (NUGT) jumped 15%. 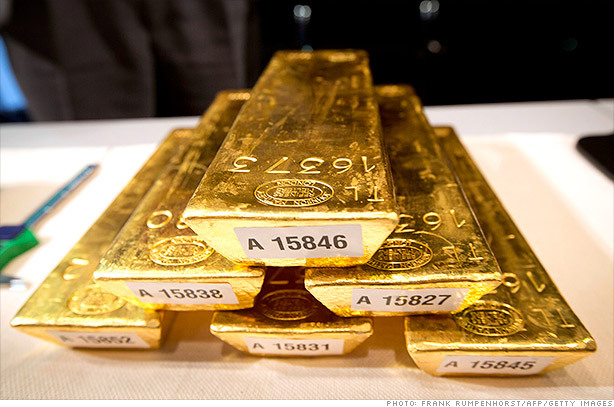 Gold prices plunged to a 2-year low April 15 in their biggest one day sell-off in decades. The culprit? Worries about China growth. Those worries haven't gone away but for now, they seem to have shifted to the back burner as investors watch the market gyrations and look for a place to park off until things settle down. StockTwits traders were cheering the yellow metal on. That could be an understatement. Just looking at the chart above shows how rough May has been for gold bugs. But I'd keep the champagne on ice for now. That was a good call ivanhoff. Looks like the miners are getting a pretty big boost today. Makes me wonder if this is a trend or if we're in for more choppiness heading into the summer. Ahh yes, who could forget the World Gold Council. Any sign of rising demand from Asia would be enough to spark interest. Couple that with the volatility we're seeing in stocks, and you've got a pretty good case for buying.